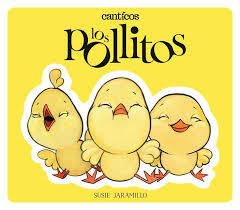 Our Cover to Cover Book of the Month for June is Little Chickies/Los Pollitos by Susie Jaramillo. This wonderful song book will provide your child with so many opportunities to explore. Not only is it bilingual, but it’s also accordion style and it has lift the flaps! So, enjoy talking, singing, reading and PLAYING with Little Chickies! Being a song book makes Little Chickies so wonderful. But amazingly enough it also happens to be a lift the flap book! Utilize the flaps in the book as an opportunity for your child to interact with book. Let them lift the flaps on their own and allow them to make predictions about what they think will be under the flaps. Little Chickies is also an accordion style book! Allow your child to play with this book and literally unfold the story and it goes along. This style of book allows the child to clearly see the sequence of the story. It also happens to be very long once unfolded. Maybe the book is even longer then your child! How many pages long is your child when compared to the book ? What other things, toys, can you measure with this book? There are so many possibilities when playing with this book! Send a picture of your child measuring themselves with the book.